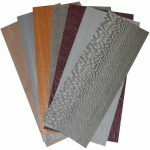 Our cost-effective veneer hobby packs are a perfect solution. Working with wood is one of those passions that only those in the woodworking industry can fully understand. Each person feeds their passion in their own unique way, from creating one-of-a-kind pieces as a gift to making many pieces of varying types to sell in their New York City community. Here at Sauers & Company Veneers, we do our part to support these amazing individuals in their hobby and business endeavors. If you are looking for a cost-effective way to add elegant features to your projects, you’ll find our veneer hobby packs an excellent option. There are two ways to go with our veneer hobby packs. You can take advantage of our standard packs, which are filled with exotic and domestic wood veneers in varying lengths, or contact us to put together a custom order. Whether you are looking for a few pieces of veneer for one or more custom pieces or hundreds of veneer sheets for a bulk project, our knowledgeable team is here to help. Most orders ship within 24 to 48 hours after placement. We offer an extensive selection of veneer products as the world’s leading supplier of wood veneer options to the woodworking industry. In our more than 50 years of business, we have supplied some of the largest domestic manufacturers of furniture. They trust us for cutting accuracy and consistent high quality, and you can, too! Whether you have a project in mind already or you want to see where veneer hobby packs could take your imagination, don’t hesitate to contact us to place an order or have any questions addressed. With more than 125 wood species and several backing options as well as exemplary customer service, we are confident you will be pleased with your experience. At Sauers & Company Veneers, we create veneer hobby packs for residents of Anaheim, Los Angeles, and San Francisco, California; Dallas, Texas; New York City; Chicago, Illinois; Boston, Massachusetts; Charlotte, North Carolina; and anywhere else in the United States.